Conduction is heat transfer through stationary matter by physical contact. (The matter is stationary on a macroscopic scale—we know there is thermal motion of the atoms and molecules at any temperature above absolute zero.) Heat transferred between the electric burner of a stove and the bottom of a pan is transferred by conduction. Convection is the heat transfer by the macroscopic movement of a fluid. This type of transfer takes place in a forced-air furnace and in weather systems, for example. Heat transfer by radiation occurs when microwaves, infrared radiation, visible light, or another form of electromagnetic radiation is emitted or absorbed. An obvious example is the warming of the Earth by the Sun. A less obvious example is thermal radiation from the human body. Figure 1. In a fireplace, heat transfer occurs by all three methods: conduction, convection, and radiation. Radiation is responsible for most of the heat transferred into the room. Heat transfer also occurs through conduction into the room, but at a much slower rate. 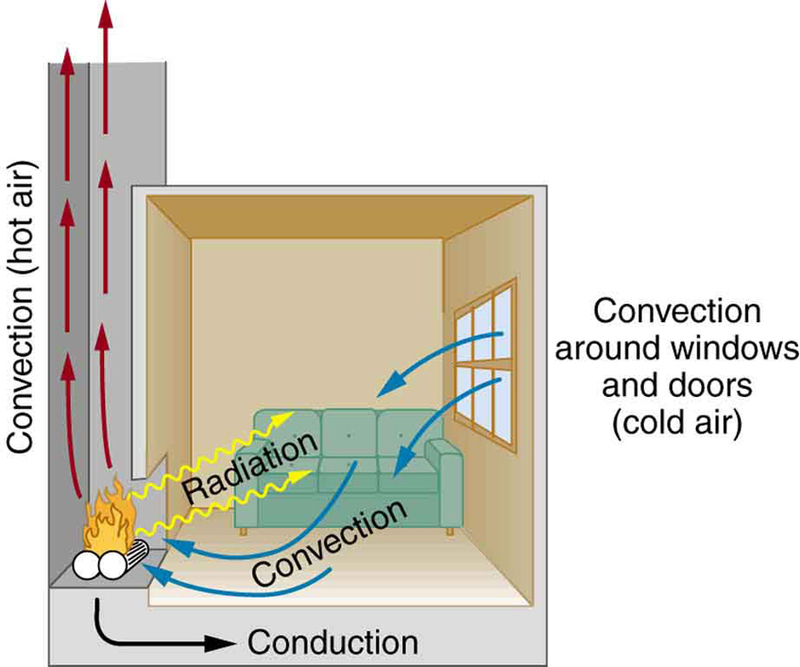 Heat transfer by convection also occurs through cold air entering the room around windows and hot air leaving the room by rising up the chimney. We examine these methods in some detail in the three following modules. Each method has unique and interesting characteristics, but all three do have one thing in common: they transfer heat solely because of a temperature difference Figure 1. 1: Name an example from daily life (different from the text) for each mechanism of heat transfer. 1: What are the main methods of heat transfer from the hot core of Earth to its surface? From Earth’s surface to outer space? 2: When our bodies get too warm, they respond by sweating and increasing blood circulation to the surface to transfer thermal energy away from the core. What effect will this have on a person in a hot tub? 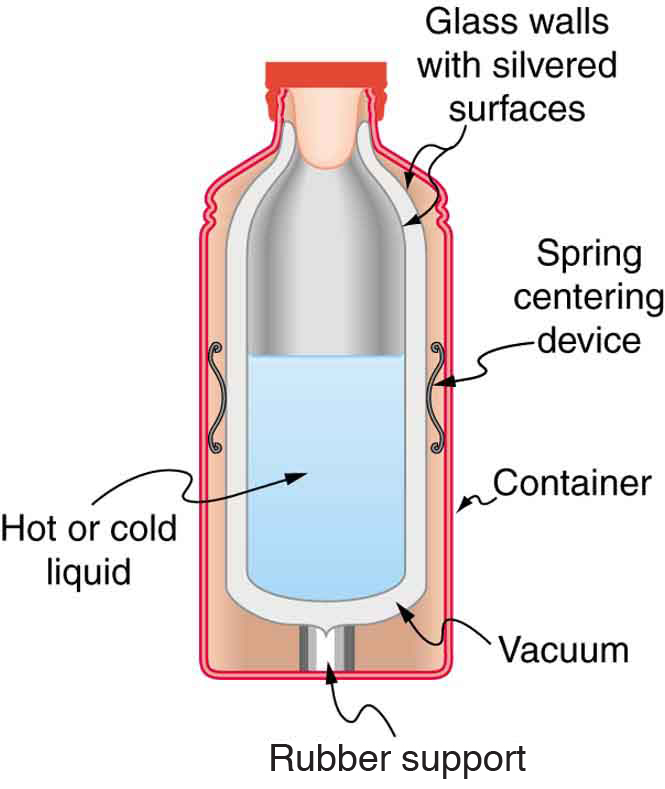 3: Figure 2 shows a cut-away drawing of a thermos bottle (also known as a Dewar flask), which is a device designed specifically to slow down all forms of heat transfer. Explain the functions of the various parts, such as the vacuum, the silvering of the walls, the thin-walled long glass neck, the rubber support, the air layer, and the stopper. Figure 2. The construction of a thermos bottle is designed to inhibit all methods of heat transfer. 1: Conduction: Heat transfers into your hands as you hold a hot cup of coffee. Convection: Heat transfers as the barista “steams” cold milk to make hot cocoa. Radiation: Reheating a cold cup of coffee in a microwave oven. 14.4 Heat Transfer Methods by OpenStax is licensed under a Creative Commons Attribution 4.0 International License, except where otherwise noted.